Satechi、iPhone Xや8の高速充電や最大60WでMacBook Proなどを充電可能な「Satechi Type-C 75W Travel Charger」を発売。 | AAPL Ch. 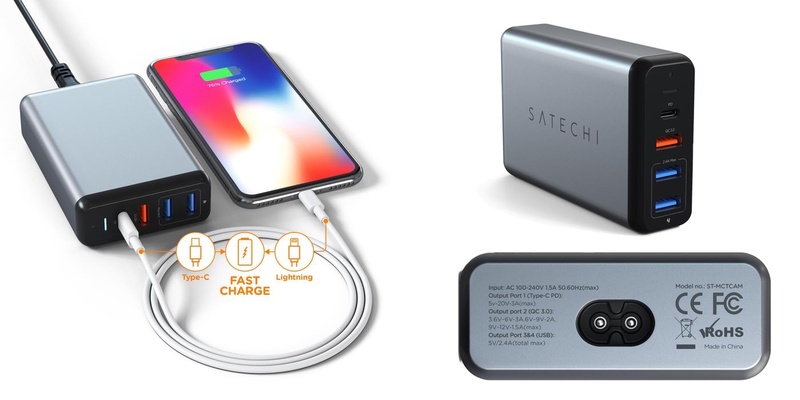 The Satechi Travel Charger features two USB-A 3.0 charging ports, a Qualcomm Quick Charge 3.0 port, and a USB-C port which supports fast charging for the iPhone X, 8/ 8 Plus, and iPad Pro (up to 60W with an Apple USB-C to Lightning cable). The charger supports up to 75W and all four ports can be used simultaneously- designed with efficiency in mind. Connect your Type-C smartphones, tablet and laptops for a quick and safe charge, up to 60W. Perfect size to take with you on the road for convenient access to a portable Type-C charging port. Features fast charging for iPhone X, 8 Plus and 8 with Apple MFi-Certified Type-C to Lightning cable.